Furthermore, the cash grants and in-kind transportation provided by FedEx have allowed them to equip Medical Reserve Corps volunteers, provide more emergency preparedness, and deliver critical medical shipments valued at more than $100 million to locally-run healthcare facilities in more than 70 countries—1,000 nonprofit community clinics and health centers in all 50 states in the U.S. Nowhere was this relationship more on display than in the aftermath of the tornado that recently devastated Moore, Oklahoma. Direct Relief promptly jumped into action and, as the only nonprofit licensed to distribute prescription medication in Oklahoma and all other U.S. states, knew that they had to transport needed medications and vaccines into the area quickly, safely and securely. Many of these specific medications are temperature-sensitive and require specialized cold-chain handling in transit. So, in order to ensure that these commodities were secure from both theft and extreme temperatures, Direct Relief used our SenseAware service offering to manage and monitor this precious cargo en route. SenseAware is a FedEx-designed sensor-based logistics offering which uses active GPS devices capable of monitoring location, temperature, light, humidity and a number of other conditions; and which includes an intuitive, user-friendly IT platform to establish parameters for sensors and monitor the actual journeys. These sensor devices will send a near real-time alert in the event of a package breach (light sensor tripped before delivery), temperature excursion or even when it crosses a pre-established geo-fence around a specific location. The Direct Relief team was thrilled to be able to deploy this cutting-edge logistics solution, and our SenseAware team was on the ground training Direct Relief staff on the service and ensuring that their first journeys were successful. 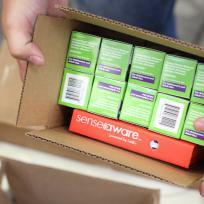 As SenseAware continues to grow its list of approved countries, the opportunity for organizations like Direct Relief and others who transport perishable life-saving products to benefit from the technology will continue to expand; and eventually, as active sensor technologies become more pervasive, monitoring solutions like ours could fundamentally change the way we track all shipments. This could move the world from a reactive scan-based model to an active positive control model which allows for more proactive intervention and recovery of goods in motion—whether moving across borders, continents or even oceans.